One of the common misconceptions about the Colorado Wine industry is that all of the wineries are located on the western slope of the Rockies. Yes, most of the vineyards are located in the Grand Valley and West Elks AVAs, but 60% of the wineries are actually located east of the Continental Divide. The major reason for this is the customer base is located along the Front Range. This fact was motivation enough for one winery to relocate from Palisade to Centennial. Desert Moon Vineyards was founded by Paul Hilbink and Debra Ray in 2002 with the first vintage released in 2004. Last year, they decided to move the production facilities (i.e., winery) to the Front Range to better meet consumer demand while maintaining the vineyard in Palisade. Debra designed a stylish tasting room where they host events, including wine education seminars, business meetings, weddings, dinners, & social get-togethers. Keep your eye on Groupon and Living Social to take advantage of great deals on their selection of educational, yet entertaining classes. 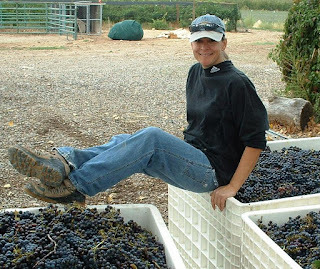 And with that, this week we welcome Debra Ray from Desert Moon Vineyards in this edition of Meet the Winemaker. I spent way too much time in an office, behind a computer screen. I realized I was never going to be happy living that life and that I really wanted to do something much more organic and have some connection to nature. I was a wine lover and amateur wine maker and had really become intrigued by the magic and the mystery that makes simple grapes turn into rich, complex wine. There is something in human nature that calls us back to the land and to the cycles of nature. Growing grapes and watching that turn into wine satisfies that need for me. I could see myself being involved in landscaping or a green house. What I’d like to say is I spend my off time snowboarding, golfing and sailing…ahhhh. The truth is that running a small business takes an enormous amount of time, and only part of it happens in the winery. Many of my days are filled with marketing, sales, bookkeeping, managing the tasting room, organizing the classes, and about 100 other things on my ‘to-do’ list. I think our next new release will be a proprietary white blend, something on the dry side, with a lot of aroma and a little spice. I’m aiming for a something that is great with food, and nice and crisp for sipping on the patio. Australia, because I love to sail, surf and scuba dive. Wine to me is so much more than points on a scale or the actual wine in a bottle. Wine is a connection to a place, a history, and a people. Given that, the best wine I ever drank was on my honeymoon. We stayed at Castello Vicciomaggio in Chianti. Parts of the castle date back to the 5th century. The castle sits at the top of a hill, surrounded by vineyards overlooking the hills of Chianti. They make the wine right there in huge wooden casks. I don’t remember what the wine tasted like, but I was drinking hundreds of years of wine making tradition, I was drinking in the Tuscan sun and soil, a summer captured for me. Something like Dave Matthews – surprising, eclectic, off-beat and always changing. The coolest thing about Colorado wine to me is that we are pushing the wine grapes to the absolute limit of what they can survive. The Grand Valley AVA is surrounded on 3 sides by rock, which helps control the temperature. There are very few places in the world where you can grow wine grapes at this altitude (4700 ft), and we are lucky enough to have one in our own backyard. Combine that with over 300 days of sunshine and you get wines of great intensity and character. I think as consumers should think that we’re lucky. I’d like to see us parallel the micro-brew industry. Colorado is known world-wide for outstanding craft beers. I think we have the same opportunity for ‘viniferous’ wines. What style of wine are we not producing in Colorado that they would like to see?